The World Logistics Center (WLC) project is a proposal to build 41.6 million square feet of warehouse and associated uses on 2,710 acres of existing agricultural lands located in the east end of Moreno Valley. The WLC southern project boundary will immediately abut the California Department of Fish and Wildlife (CDFW) [the name was changed to "wildlife" from "game" as of 01/01/13] San Jacinto Wildlife Area (SJWA), the principal Multiple Species Habitat Conservation Plan (MSHCP) Conservation Reserve and the most important biodiversity conservation site in western Riverside County. The WLC project description is fatally flawed: The SJWA is owned in fee by the CDFW [click here for 4 grant deeds] and has never been owned by Mr. Benzeevi; the SJWA is not part of the WLC Specific Plan—the Moreno Highlands Specific Plan expired in 2011; the alleged "conservation buffer" is a falsehood and does not exist. All of these groups are concerned about the significant impacts to human health due to an increase in mortality and illness from some of the worst air quality in the world made worse by diesel exhaust, the increase in greenhouse gases and global warming, the increase in diesel truck traffic on the freeways and in neighborhoods, the loss of agricultural land, the use of the publicly-owned San Jacinto Wildlife Area as mitigation for this private project, violations of state planning and zoning laws and the project’s growth-inducing and cumulative impacts. 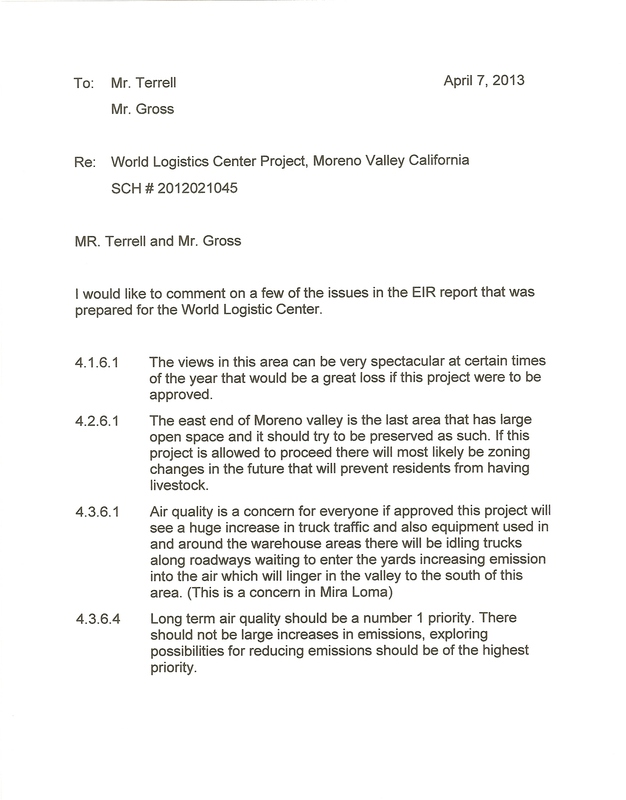 The draft environmental impact report (DEIR) http://www.moval.org/misc/wcl-deir.shtml comments submitted so far are listed below and will shortly be organized under organizations and topics for your ease in reviewing. Comments on the WLC DEIR may be made in writing or in person up until the time the City adopts or denies this project. Click here to view a pdf of a sample letter you may want to use in making your comments. Click here to download the Microsoft Word document. Comments are in pdf form. Click to open in a browser window. Right-click (Windows) Control-click (Mac) to download. There are size notation on the larger files.